You made it to the Powerball page, you have taken your first step toward experiencing one of the most exciting games in the known universe. Powerball. So, why is it so awesome? Let’s begin with the life-changing jackpots that start at 40 m-i-l-l-i-o-n dollars. That’s some chillin’-on-a-beach-with-a-jewel-encrusted-umbrella-in-your-drink money. Then add in the fact that you can multiply your winnings up to 10x for $1 with Power Play. Yes, just one single, solitary George Washington can put up to 10x the cash in your pocket. Still need another reason to play? How about nine more? That’s right – this game gives you nine chances to win. Nine. Nueve. IX. Just ask a cat. That’s pretty amazing. And you know what? You can experience all this joy with drawings twice a week on Wednesdays and Saturdays. That’s one more time than Taco Tuesday, and you know how much you love those. Welcome to Powerball. Pick five numbers from 1 to 69 and one Powerball number from 1 to 26. Choose Quick Pick to have the terminal randomly pick numbers for you. Each Powerball ticket is $2 ($3 if adding Power Play). 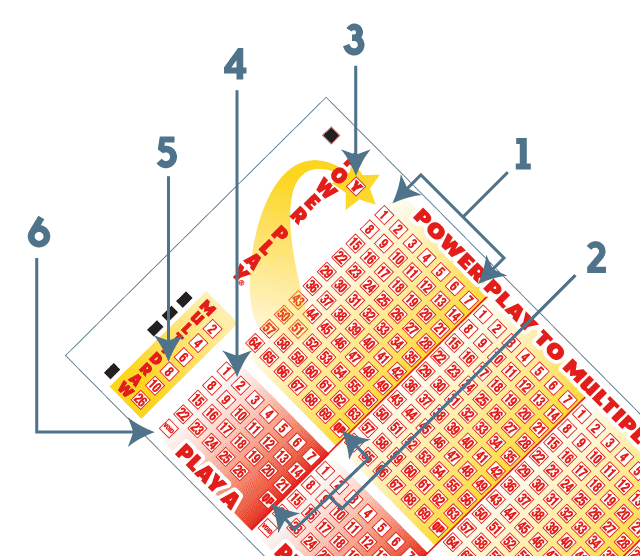 Up to five sets of numbers can be played per play slip. Select Multidraw to enter up to 26 consecutive drawings. The Powerball jackpot is won by matching five white balls, in any order, plus the one red Powerball number. The second-level prize of $1 million is won by matching all five white balls, known as a Match 5. You can win seven additional ways by matching fewer numbers (see Prizes & Odds chart for details). Play five numbers from 1 to 69. Choose Quick Pick by marking QP. Add Power Play for $1. Pick a Powerball number from 1 to 26. Select to play consecutive drawings. Mark to void the panel. Overall odds of winning a prize is approximately 1 in 24.87. *The jackpot prize is estimated and shall be determined on a parimutuel basis. The jackpot prize will be divided equally among all winning plays for that prize level. The jackpot can be paid out either as a discounted lump sum payment or an annuity over 29 years (or 30 payments) as set out in the Powerball game rules. If the winner chooses the annuity, the annual payment will be increased each year by a rate as determined by the MUSL Product Group. The jackpot prize may be a guaranteed amount in certain circumstances and announced by the MUSL Product Group. All set prizes and Power Play prizes, including the Match 5+PB prize, may be reduced if claims exceed available prize fund. In such circumstances, these prizes may become parimutuel as defined in the game rules. Parimutuel means that prize amounts are shared equally among all winners of the available prize pool for that prize level. *The 10X multiplier will be available for advertised annuity jackpot levels between $40 million and $150 million, or announced for any higher jackpots as determined by the Powerball Group. Powerball sales end at 9:59 p.m. Wednesdays and Saturdays and resume after the drawing. Once a ticket is generated it can’t be canceled, so check your play slip to make sure everything is correct. Have a retailer scan your ticket and keep playing your favorite numbers. Repeat Play is a feature available for all draw games that allows a retailer to simply scan the bar code on your existing ticket so you can replay your favorite numbers fast and easy! Repeat Play is an alternative to completing a play slip. Repeat Play reprints all the selections from the original ticket including: your numbers, the number of draws, boards, play type, play amount, Megaplier and Power Play Option. Quick Pick wagers will be printed with the same numbers as the original wager. Tickets must be replayed within 30 days of original ticket creation. Repeat Play does recognize MultiDraw and will begin the draws on the first draw day available and continue for as many draws as the original ticket. Repeat Play is not available for Advance Play. Is playing the Lottery no longer fun?